Converting a PDF document to JPG can be easy if you have the right tool. There are even online tools that are completely free and will convert a PDF document to any format in just a few minutes. But what if the PDF file you want to convert is very large? In this case the best option would be to compress the file before conversion or find a tool that will compress it and convert it at the same time. In this article we take a look at how to compress PDF to JPG in various ways. Knowing how to compress a large PDF to JPG may be the only way to share really large PDF files. Large files can present a problem when converting to other formats. Iit is possible to lose some of the information on the file during the conversion process. This is the main reason why you should only choose the best tool to compress PDF to JPG. A good PDF to JPG compress tool will offer the perfect balance in ease of use and effectiveness. Lucky for you, we have a tool that is perfect for converting PDF to JPG since it is easy to use and effective at the same time. This tool is iSkysoft PDF Editor 6 Professional for Mac (or iSkysoft PDF Editor 6 Professional for Windows) and the following is how to use this PDF tool to compress PDF to JPG. Begin by installing the program to your computer. Launch the program to continue. To open the PDF document, you can simply drag and drop it into the program's main window. You can also click on "Open File" and then browse for the file you need. Before converting the large PDF to JPG, you first need to compress it. To do that, click on "File > Optimize PDF." This will optimize the PDF file in quality and size by removing unwanted objects that may make the file larger than necessary. With the large file compressed, you now just need to convert it to JPG. To do that, click on "Convert > To Image" and select the format as JPG. Set the page range in the toolbar to your right and click "Convert". 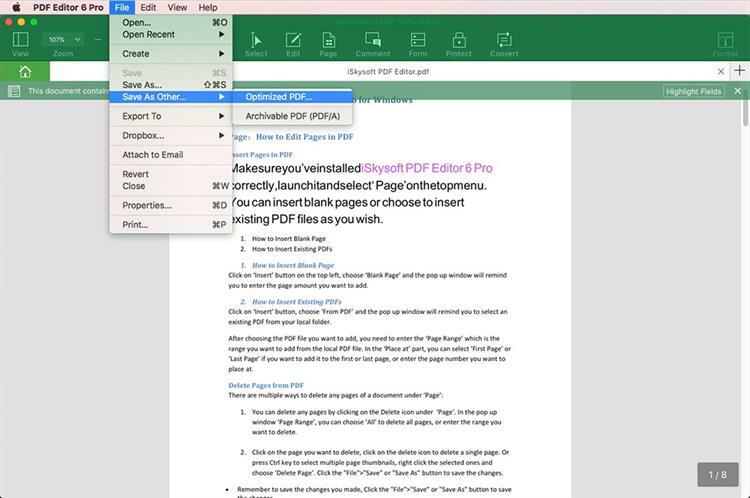 As a tool to handle large PDF files, iSkysoft PDF Editor 6 Professional for Mac (or iSkysoft PDF Editor 6 Professional for Windows) stands out among the many for so many reasons. As we have already seen, it is one of the easiest tools to use when you need to compress a large file before converting it to JPG. But its superior features allow it to do more than that. Some of those features include the following. It can be used to convert PDF files to very many other formats including Word, HTML, Excel, PowerPoint and many more. 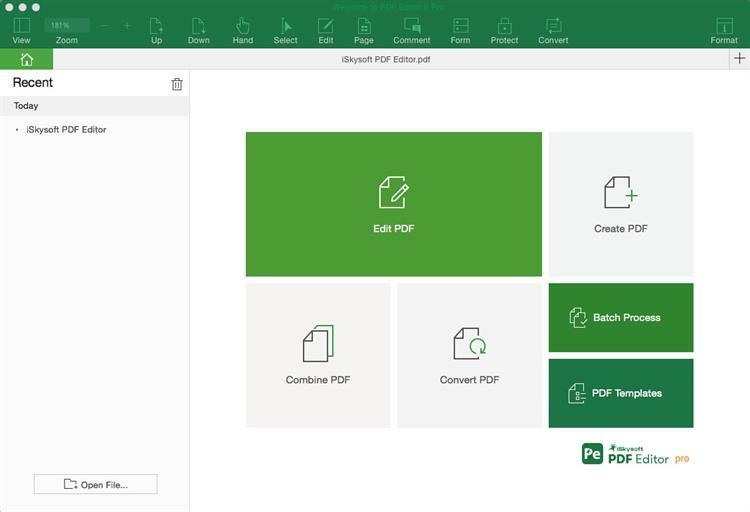 You can also create PDFs by opening a document in any one of the formats. 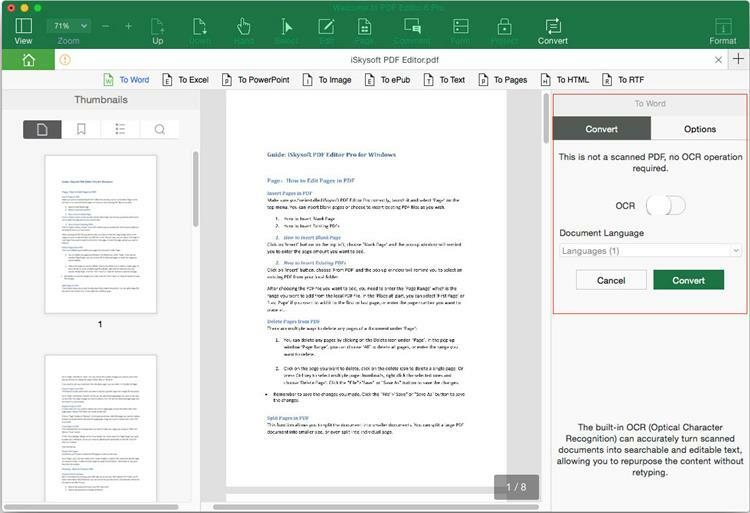 It has impressive mark-up tools that make reading a PDF easy. You can use these tools to add comments and stamps to the document. You can also highlight and underline text in the document. The editing features in this program are as effective as they are easy to use; allowing users to edit the text and images in the document just as you would on any word processor. It also has great security features designed to keep your document away from prying eyes. You can password-protect a document or add a signature to protect it. The program also makes it easy to save and share the PDF document you are working from inside it. 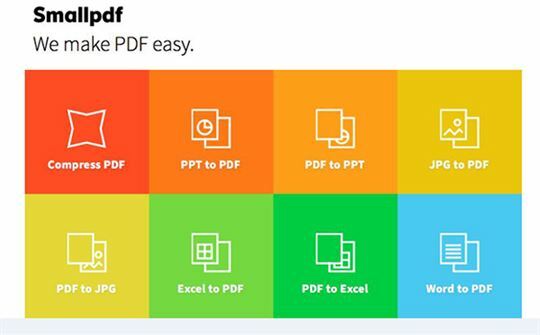 SmallPDF is an online PDF program that offers a suite of tools to help you manage a PDF document and compress PDF to JPG online. One of those tools is Compress PDF that will allow you to easily reduce the size of a large PDF document. It is really easy to use, allowing you to simply drag and drop the file you want to compress and download the smaller file at the end of the process. Since it also has a PDF to JPG converter, you can easily convert the large file to PDF online free of charge after compression. It is completely free, easy to use and very effective. The compressed file can be converted to JPG right on the webpage. It lacks additional PDF management features like PDF editing. Like SmallPDF, iLovePDF is an online solution that provides a lot of tools to manage a PDF document. One of them is iLovePDF Compress and like most of its other tools, there isn't much for you to compress PDF to JPG online. All you have to do is select the file either from your computer, from Dropbox or from Google Drive and the program begins compressing the file immediately. You can then use iLovePDF PDF to JPG converter to covert the compressed file. It is very easy to use and the compressed document doesn't lose its quality. You can also simply convert the compressed file to the PDF. You may not be able to compress multiple files at once. It may not be ideal for the compression of image-rich PDFs. PDF Compressor is another large PDF to JPG converter online that you can use to compress a large file so that you can convert it to PDF. Like most of the online tools we've already seen, it is also very easy to use, allowing you to drag and drop the file into the program's window to compress it. It has one other advantage over other online PDF compressors; it allows you to upload multiple files at the same time. Can compress multiple files at once. You can convert the compressed file to JPG on the same program. It lacks other PDF management features like editing. You may need to compress a PDF file and convert it to JPG when you need to send the file via email or social media. The smaller file makes it easier to send and converting it to JPG will make it easier to share the information readily. But there are some issues you may face when attempting to convert large PDF to JPG. These issues include the following. If you are using an online tool, you may find that some tools have a limit in the size of document you an upload. It is also no advisable to compress multiple files at the same time since the quality may be affected. Compressing and converting very large files to JPG can take a very long time even with the best tools at your disposal.